Wiedner Hauptsrtrasse 27-29, 1040 Vienna, Austria. 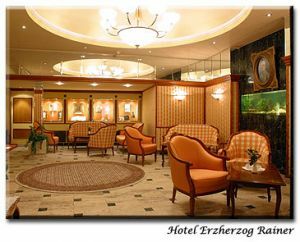 Hotel Erherzog Rainer 20th century is located in the city centre. It is also close to the State Opera and other historical buildings. Tourist attractions include the Karls square and Freihausviertel that are 5 kilometres away. 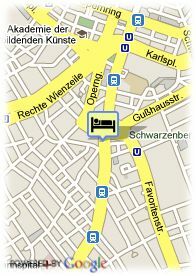 The hotel features 84 comfortable rooms, the hotel also offers an in house restaurant serving Viennese cuisine. Well-equipped meeting and banquet rooms are also available. Paid public parking near the hotel (covered) (20.50 €), Reservation obligated. Near to the university, Centre, Museum Area, Near the historic centre, Near subway / tramstation. Book your breakfast together with your room reservation, or at the latest upon your arrival in Hotel Erzherzog Rainer, and you'll receive internet use free of charge and a 10 % discount for all food and beverage consumptions for the length of your stay at the three Schick-Restaurants. The Wiener Wirtschaft at Hotel Erzherzog Rainer offers upscale tavern cuisine focussed on Viennese Cuisine. The central, convenient location in walking distance to the Vienna State Opera guarantees a vacation in which there is the opportunity to immerse oneself deep into the Viennese soul.